Three minutes ago I wrote about having a clean theme that focuses on design and little extra technology and now I'm going to wax lyrical about a theme that uses the technology. I could use Monday as an excuse, but I won't - it's just the quality of themes now available. Also, it's not that I don't know what it is I want or like, it's that every theme has its place. Or to be a little more precise, I've finally figured out that every site has a particular theme need. 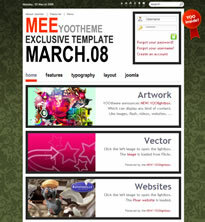 If you've got a portfolio you want to show off then this from YOOtheme is perfect. I've also got to admit that I'm not a member of YOOtheme so I can't talk from experience but it really does look good. I remember thinking I was going to join up when they did a horizontal theme but for the life of me I've not, I'll try and remember why and then probably sign up. This theme focuses on simplicity and technology. In essence it's not a theme where you're going to be publishing loads of content to the homepage - more a theme that is going to be fairly static on the homepage and more focused on pushing to the content.